HAPPY VALENTINES DAY WORLD! I especially love my family, friends, nature, and hiking! This is a montage of a 3 year promise I made to my son. On his birthday after DRIVING to the summit of Pikes Peak I made a promise that I was going to change my life and we were coming back in 3 years for his Senior Trip and WALKING up that mountain! A special thanks to my wife, friends and of course my son. This year we are going to do it again and we are going to do it BETTER! Our Summit of Pikes Peak - Part 3 of 3: Day 2 - The Summit or Bust! Day one ended with many blessings. Relaxing and recouping at Barr Camp, enjoying the spaghetti dinner there, the comradery of other hikers, campers and the camp care takers, but most of all, the arrival of my niece and her family. My niece, her husband, and their sweet young children, one of which is my Godson, traveled from Texas, took the cog rail up to Mountain View, and hiked the mile and a half over to Barr Camp just to spend one night with us at the camp, and then meet us at the summit the next day! The entire purpose of this trip was to fulfill a promise to my son that I made 3 years ago when we drove to the summit of Pikes Peak on his 16th birthday because I was extremely to unfit to make ANY type of hike on the mountain. The gift of my promise was returned to me as I saw my son’s leadership skills first hand. All three of us, my wife, my son, and I are all VERY HARD HEADED, but this time I kept my mouth shut, for the most part, and enjoyed stepping back and letting my son take charge of the Day 2 hike to the summit. At the end of day one, he reached out to others at the camp, explaining our day, and most importantly LISTENING to the advice and instructions from the veterans at the camp. Key to this; carry ONLY what you must and make sure to drink every 15 minutes and EAT at least every hour! Simon walked into the upper cabin where we were all staying and exclaimed “Alright let’s lay out what we are bringing to the summit! All we need is food, water, and rain gear. If you get hurt you can have 1 Band-Aid!” He further instructed, “Mom set a timer on your phone to remind us to eat every hour and we are going to drink water every 15 minutes.” I was proud to see him in action as we laid out only the essentials that we would carry up to the summit. My son went around to each of us asking, “How much water do you think you will need?” He did the math, rounded up the appropriate amount of bottles and then went and collected and purified the water from the stream. “I am the youngest and most fit. I will carry the one back pack. The rest of you can help by each carrying a bottle of water. As the day progresses and we eat and drink my pack will get lighter making it easier on me as we reach the summit.” That is MY BOY!!! Now, this plan only worked because of my INCREDIBLE niece and her husband. They gratefully accepted taking a pack stuffed with ALL of our remaining gear with them on the train and up to the summit! What an incredible gesture to drive out for an overnight stay just to root us on and help us out! Another form of support was all the other family, friends, and supporters from Facebook. Their words of encouragement and compliments of my family efforts kept us driving on, but the most important gift of all were the PRAYERS! Of the greatest Facebook supporters was an incredible woman named Terri who every day for SEVERAL months posted pictures of Barr Trail and Pikes Peak on the Fourteenthousand Onehundredten Facebook page. But Terri did MUCH more than that as will be learned later in this post. The night before, one of the caretakers at the camp, Renee, asked how long it took us to get from the trail head to the camp. “9 hours” was the response. “Well, then it should take you 10 to make the summit.” Though I did not physically see any, I swear at that moment I heard crickets. Soon after I started hearing the squeaking grinding of cog wheels as my mind began to process time windows. I had made arrangements to meet on the summit between noon and 1 p.m. with a gentleman that at the time of this writing must remain private (I don’t want to ruin any surprises). “cccrrreeeakkk…. whhizzz… clank… ccrreeaakk…. clank…. cccrrreeeaaakkk…. DING!” …. “2 a.m.” … “2 a.m.!” “We MUST start hiking at 2 a.m.”! Bundled up in our toasty 40 degree rated sleeping bags we rolled out of our surprisingly comfortable bunk beds at 4 a.m. So on with the ankle braces, knee braces, Bio-Freeze, hiking boots, jackets, skull caps, and gloves. Of course we made one more run to the last closed in in restroom for the next 6 miles. Then off we went into the dark with my wonderful family cheering us on as we marveled at the fact that we could see our breath in the light of our headlamps. The temperature was around 40 degrees. On we marched carefully watching our steps. The stones were still, and some man-made steps with ties were not too terribly difficult to navigate. The trail was a bit confusing in just a couple of places but we felt confident we were on the right path. Fifteen minutes in; “Drink!” ordered our leader, and we did. I personally was already a bit winded and confessed so to the group. Thankfully for me my wife said, “So am I”. I was just happy to not be alone. We had to book it. I wanted to be at the summit no later than 1 p.m. I felt great, actually. I was not sore. My ankle was not in too much pain. I had slept well and was refreshed. Oh, and my new hip, the one I received just 20 weeks prior; though the muscles on that side were still a little weak, was doing GREAT! “WE CAN DO THIS”! We marched on drinking every 15 minutes. I was the slowest of the group so I lead the charge. About an hour in as the sun was creeping up I began to see just how steep the climb was. “Dang it!” I did NOT need to see that! It was nothing more than a mind game. I remembered what so many GREAT supporters on Facebook and hiking family members had said, “Pace yourself. Walk a few steps and rest”. My dilemma was that I MUST make the summit by 1pm. “1, 2, 3, …. 50, 51…. 98, 99, 100 steps. Stop. Take 5 deep breaths. Repeat.” And so was the grind for the next five and a half miles. Of course that grind was broken up with timeouts called by my son, our enthusiastic leader. “Time to drink”. “Time to eat”, which happened to work out to be about every 30 to 45 minutes. It was during one of our chow sessions that we had one of the most pleasant moments we had been waiting for on our hike; OUR BIGGEST CHEERLEADER HAD CAUGHT UP WITH US! “HELLLOO?? ?” we heard. “TERRI!!! Is that YOU??? ?” Sure enough! Terri, a local and 4-time summit veteran of Barr Trail, had caught up with us to support us and cheer us on the rest of the way! Back to the topics of supporters AND hiking up the side of a mountain at 2 a.m. As mentioned previously Terri had been one of my family’s biggest supporters on Facebook where we met. Terri had dinner with us at the Colorado Brewing Company earlier in the week so we could both do the whole, “is this person a weirdo test” in person. Sure we enough we all passed. We all are definitely “WEIRDOS”. I mean who wants to walk 12 plus mile up a mountain in little oxygen and possible harsh conditions? Luckily for us LOTS OF WONDERFUL WEIRDOS! This awesome new friend hit the Barr Trail head Sunday August 10th at 2 in the morning. And by the time we headed out from Barr Camp was only 30 minutes behind us! “Chugga, Chugga, Chugga, Chugga. Chugga, Chugga, Chugga, Chugga. CHOO CHOO!” This woman was a beast! “There’s the A-Frame!” A public structure created for refuge in the event shelter is required on the side of the mountain; especially in the event of harsh conditions. This was about the halfway mark to the summit. It was 9 a.m. Now thinking back to the actual time, down to the minute, that we walked away from Barr Camp it was 5:23 a.m. “Wow. We are making much better time today and I feel great!” … “Drink and eat … Drink and eat” … “At this pace we will be able to make summit by 1 p.m. without a problem!” Water drank, food ingested, water bottles refilled, and bladders re-emptied it was time to move on! “Here comes the tree line.” The area above the tree line had been described to me by veteran Barr Trail hikers as walking on the soft sand of a beach, but it is small pebbles, up a steep grade, no shade, and little oxygen. There are no trees above tree line because there is not enough oxygen to support them. The mind game was on and buddy, WE WERE DETERMINED! “1 p.m. summit. Gotta move.” I stepped on but as I rounded switch back after switch back I soon realized that the gifts and surprises waiting for us at the summit were no match to what was I missing by scurrying on. View after view, angel after angel; it was breathtaking, even more than the lack of oxygen at this height. We continued on with our grind. It was a challenge to breathe. The breaks became much more frequent and the large step ups onto, and over smaller boulders deprived my muscles more and more of strength. A great blessing that we had is that clouds had rolled in and the sun was not beating down on us. “How much harder would this be if I was dealing with lack of O2 and the bearing sun?.” I realized at that moment that the prayers from all of my family’s wonderful supporters were being answered. It was pleasantly cool, near cold, and I still felt GREAT; I just needed to keep pacing myself. “Look!” I hear Terri exclaim pointing to the front of us “I big horned sheep!” Staring off in the distance was a lone big horn sheep, galloping down the side of mountain with incredible grace and speed. I continued to be in awe as I was finally able to have such an experience in person and not living through somebody’s video on the Internet. We continued on the trail, again parts of it not even looking like trail to me. There was no way we busted our noon summit and there was no chance we would make it by 1. The clouds were thicker than ever and then “BOOM!” THUNDER! It was right on us. It didn’t matter now; we were closer to the summit than any retreat so move forward we did! My head was down. It was cold. My fingertips were tingly and pink so I put the gloves back on that I had removed earlier in the day. “There is the sign for the 16 golden stairs ahead” Terri stated calmly. “There it is …. ahhh.... there it is…. the home stretch….” Emotion was starting to take me over. “I am not going to cry” I told myself. We paused for a photo op at the sign. We caught our breath. We ATE! We began. My son jumped ahead of me in case I needed a hand. Steps were slow and cautious. BB’s of frozen rain drops pelted us. It was EXCITING!!! IT WAS AMAZING!!!! The climb was exerting. At times my face was inches from the ground and that is when I paused and I took a moment to really study what it was that was pelting us. These perfectly round, white and crystalline balls. I could see tiny striations in some, on others just a small kiss of a tiny point. They were so clean, so perfect; they were beautiful. We climbed on, pushing, pausing, breathing heavily… and then…. smooth trail! We had made it past the gauntlet of the Golden Staircase. Emotion started taking over again, as fought crying, a little less successfully this time. “I am NOT going to cry” I exclaimed to the group. Looking up, the clouds were a soup, but through the white murk, just yards above a perfect rectangle began to appear. “That’s it!” My wife Trish stated, “That’s the summit house!” “Wow” and then we turned to the right and continued on the trail. The summit house was above us …. NOT in front of us. A few more switch backs to go. Anticipation was growing. Adrenaline was pumping. The steps came easier. “CHUGGA, CHUGGA. CHUGGA CHUGGA!!! !” Then I FROZE! I could not believe it! No it was not the summit sign it was something straight out of a movie. A large heard of big horned sheep and their ewes stood above us; 12 to 15 of them. Majestic and proud and is if they were there to greet us. As if they were there to congratulate us! “Look!” I exclaimed “Look there!” … “Yes the summit house is right there” was the response I got. “No Look in FRONT of us!” We stood in amazement. I was in a state of euphoria that I can only compare to my wedding day and witnessing the birth of my son himself. 2 more switchbacks to go! They were smooth, they were leveling out! And then, THERE IT WAS!!!!!!! THE SUMMIT SIGN OF PIKES PEAK!!!!!!! EMOTION WAS LOST AS I BAWLED! TURNING, I GRABBED FOR MY SON; WHO BAWLED!!!!! AND WE REACHED FOR MY WIFE; WHO BAWLED!!!!! WE MADE IT!!!!! WE MADE IT!!!! A 3 YEAR PROMISE!!!! PIKES PEAK!!!!!!!!!!!!! 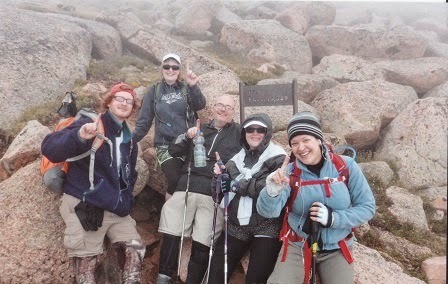 Our Summit of Pikes Peak - Part 2 of 3: Day 1 - The Hike to Barr Camp. We had planned to arrive at the Barr Trail head at 5 a.m. We got there at 5:30 a.m., and not a parking spot in sight on the upper deck area next to the actual trail. I was confident the extra 30 minutes wouldn’t have mattered. People had been there since midnight and slept in their cars. Parking per day at that spot was $5 or $10 a day. Around 6:00 a.m. paid parking down from the Cog Railway Station became available. Overnight parking was $20. We finally hit the trail around 6:30 a.m. We were off! 3 flights of “stairs” / switchbacks and it quickly became evident; “Every ounce of weight you carry does count”; it was time for a break. There were several breaks. Water weighs quite a bit, and all those other little things you THINK you need you will soon realize you don’t, but it is too late (leave no trace). Chugga, chugga. Chugga, chugga. Chug…..ga ch…. ug…. ga……… I need to sit down, for a while…. WHOOP! Clouds started forming above, dark ones, “got to move... but I should rest and eat. No I will eat a little something and walk at the same time. “ I inserted some solid form of nuts and grains into my mouth….. “Dry as rock…. BLEH!” I spit it out, sipped more water. “Go…” Thunder clapped…. “GO!!!! Spread out from one another but GO!! !” And then, ”phew!”. The clouds passed and out came the sun! “I have got to REST!” We found a log and sat, and sat, and cooked and sat and cooked…. “ugh... let’s get going!” I stood up. I took 10 Steps. BOOM I began to black out. I began to sweat like mad. “I MUST sit down. MORE WATER!” Enter my hero and his mom. My son showed great compassion and leadership qualities. He walked me back to the log where we had been resting. He took over carrying any extra items I had already been carrying two backpacks. My wife took over carrying some items too and acted as my Water Girl”. But with all that, for me to go on I had to leave something else behind that even though it weighed nothing, MY MODESTY! Off went the shirt I was down to boots and shorts… Oh those poor people we met on the trail who had to see that! The cost of their therapy to erase that image from their mind will easily burn their insurance deductible. Onward I trudged, dying, stopping every 50 to 100 yards for the next 2 miles. My son provided assistance to sit down and stand up. He patted on me and encouraged me. He even broke out his phone to play “theme music”! I felt defeated, tired, and like I was dying. We were down to mere sips of water now. Simon would run ahead and scout and come back with, “It’s just right there”. We press on. I just wanted to sleep. I just wanted to lay down and sIeep. I hobbled to the log. I somehow began to stretch the groin, but simple butterfly stretches weren’t cutting it. I was cramping in other muscles too. “WHERE DID THOSE COME FROM???? What is the counter movement??? Just stretch, control your breathing, just relax…… “ Finally... Finally; the cramping subsided, the breathing was back to normal and we moved on. Then a VERY LONG soon after there was the first bench outside of Barr Camp! I had seen it so many times in photos and videos…. “AHHHH…” I went to sit one last time before dragging myself across the small bridge and onto the benches outside of the Barr Camp cabin at 3 p.m. I did not even think about the fact that the last time any caloric substance hit my stomach was before 5 a.m. that morning. I foolishly hiked 6 uphill miles over 10 hours with no food. Moral of this DAY 1: drink and EAT, drink and EAT, drink and EAT, drink and EAT. EVERY 15 to 30 minutes DRINK AND EAT!!! Our Summit of Pikes Peak - Part 1 of 3: Preparation. I grew up in west Texas and for two August summer weeks, every high school year, I endured 2-A-Day football practices in blistering heat on a practice field peppered with sticker weeds. I always thought that was the most physically and mentally challenging activity I would ever perform. That is before I vacationed at an elevation 5,800 feet higher than where I lived and then hiked another 7800 feet higher. While I will equate those 2-A-Day practices to how difficult the hike was, reaching the summit of Pikes Peak is, by far, the greatest physical accomplishment of my life; so far. I want to share my experience for a few reasons. One is to just have the experience documented. Two is to let others, especially those new to hiking and, even more so hiking at high elevations, my lessons learned. Finally; three, just to relive the experience as I recount some of the greatest memories of my life. I was told by those experienced, “you need to hit the stairs”, “you need to work your legs” and all I heard was, “you need to do cardio”. NO! Pay attention, especially you flatlanders, YOU NEED TO HIT THE STAIRS! YOU NEED TO WORK YOUR LEGS! I prepped by walking a few trails with smooth ups and downs, I walked for miles around our nice neighborhood and parks with some inclines but that is NOT what you are going to find on Barr Trail. Looking back through the haze of my oxygen deprived memories I would guess that 80% of the trail was STEPPING UP and heaving my weight in lunge like fashion to progress forward. I found that for the other 20 percent of walk where I could take little half steps and trudge forward I was fine, but for the other 80 percent my calves and quads were SCREAMING for oxygenated blood. I heaved my still very overweight body, and at times strapped with a backpack up just 8 to 12 inches. After those 1 or 2 steps my breathing would rapidly increase working to get oxygen and blow off carbon dioxide. Train with a weighted back pack. Train on uneven ground. Train with the gear you plan to use. Practice, train, practice, train….. I also learned I should have done more than just train physically. I had one VERY disappointing moment just 1 switchback and 100 yards away from the summit. I could not figure out the action camera I was gifted with for Father’s Day! I was to winded, to light headed, and to emotional to figure out how to change it from taking photo’s every 1 minute to constant recording. So I did not get to film our team’s final steps up the summit. Practice, train, including with your gear! Here is another embarrassing tidbit. I left our trekking poles in Texas! We bought more in Colorado of course, VERY nice one$, VERY light weight one$. They pulled apart and collapsed on to themselves for VERY quick $torage. Unfortunately as we hiked the basket at the bottom of the poles would get stuck in a crevice or on a bush and a pole would pull apart and collapse! The first stop the day after the summit was to take these pole$ back! So we did where a store clerk quickly showed us how to lock the poles in place to prevent that from happening! They did this of course by pointing out the instructions, in pictures, displayed on the LARGE shopping tag connected to the poles themselves that was there when we purchased them. In the “techy” world we refer to this as RTFM (Read The F$@%ing Manual). Practice with your gear, study your gear, know your gear before you go. No matter HOW SIMPLE you may think it is. Tomorrow - I will post DAY 1 of our 2 day hike. 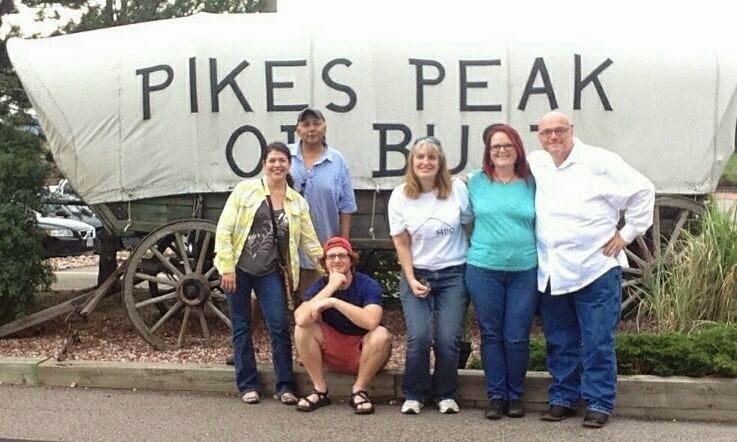 I made a promise that we would walk up Pikes Peak to my son (seated in the picture) 3 years ago this month. That year we visited Big Bend, Carlsbad Caverns, and Pikes Peak. At each National Park he wanted to hike explore and play. I was in denial of my obese condition but reality quickly hit and I could do nothing with him. I forfeited a lot of great memories and experiences. By the time we had driven to the summit of Pikes Peak I was completely beaten down with shame and sadness for disappointing Simon. The depressed look on his face to this day sickens me. It was on the way back to Texas I apologized and promised him in 3 years for his Senior trip we would return to Pikes Peak and we would walk up that mountain. I was 370 pounds with a 60 inch waist. Since then my weight has been a roller coaster but have netted a 130 pound loss and brought my waist down to 42 inches. I also replaced my right hip which I damaged in 1986 in a car wreck. Now we are driving to Colorado Springs to complete this promise. We hit the trail head of Barr Trail 8/9 will go half way and spend the night at Barr Camp and then summit 8/10 which also happens to be Simon's 19th birthday. Tomorrow we hit the Barr Trail trail head, will spend the night on the mountain at Barr Camp and summit on Sunday. We arrived in Colorado 2 days ago and went straight to the trailhead of Barr Trail to practice both physically and mentally. We went about a1/4 mile up the trail just to get a taste. I have been telling other Texans that are going to hike up with us, "we have no idea what it is REALLY going to be like" I felt the truth in my own words while walking up that 1/4 mile. The trail is even more intimidating for me than I thought. Especially after stumbling to get around a precarious rock, while a hundred foot very step drop off was just to my right. From a physical perspective I could definitely be in better shape. What I am proud of is that I had my right hip replaced March 20th and while not as strong as had hoped that leg would be it has held up very well. I don't know how affected I am by the oxygen at the 6500 foot level at the base of the mountain in Manitou Springs but I don't feel like it has affected me very much if any at all. We have trained every day this week. Yesterday I went part way up the Manitou Incline, which is a mile of stairs straight up. I made it about a quarter mile of the way up and then descended back down; which was even MORE taxing on my quads than going up! This was do to the slow step down really feeling the burn as I lowered my body to the next step. We are ready as we will ever be! Today is rest day our legs are sore! We will be driving to Leadville Colorado today, the highest town in the USA at 10, 152 feet. The group in the picture are those I am very blessed to have joining my son and me on this adventure. Seated in the picture is Simon, my incredible son to whom I made this promise. To the left are Mike and Lisa Martinez. Lisa is also blogging about this adventure at Catholic Tourist's web site. In the middle is a new wonderful friend Terri who had also turned her health around and made this trek 5 times already! At my side is my incredible, supportive wife, that has lost over 90 pounds in preparation for this adventure. Then there I am on the right. Thank you ALL of you who have supported us; Family, Friends, and Facebook pals! Especially those of you on facebook that have encouraged me, educated me, and at times have tried to SET ME STRAIGHT! So tomorrow we are off with a strong will, great support, and prayers for a safe hike and good weather. PIKES PEAK OR BUST! No it is not the most pleasant of subjects but I like to think myself as a realist and as thorough. Here is a link that tells you how to deal with number 2! Most importantly folks focus on the "why" to follow the instructions especially around water sources.